The video below is combining LH 6224 3200 EZR by Hillsdale, IL with Fred Howard. We are back in the field and could possibly get some beans started tomorrow! The sun has been shining, and the wind has been blowing. At last, we have weather conditions that are favorable for getting back into the field! 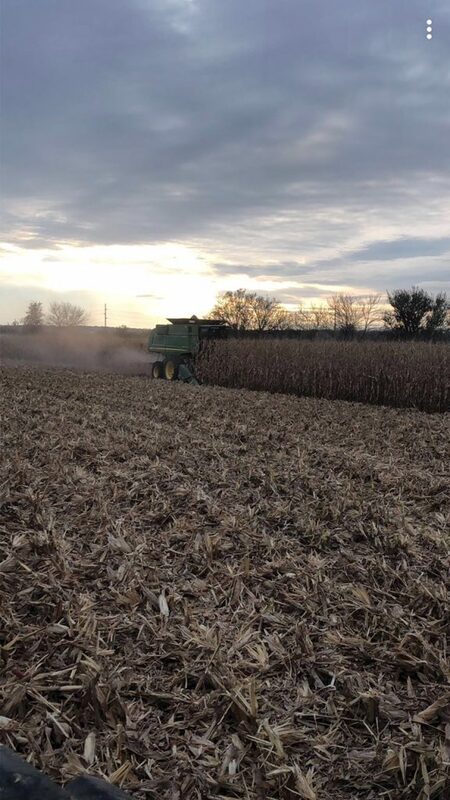 We harvested this Latham SuperStrip corn plot, which was affected by a tornado that damaged Vermeer in Pella, Iowa. This plot also experienced heavy winds, hail and heavy rain late in the growing season. 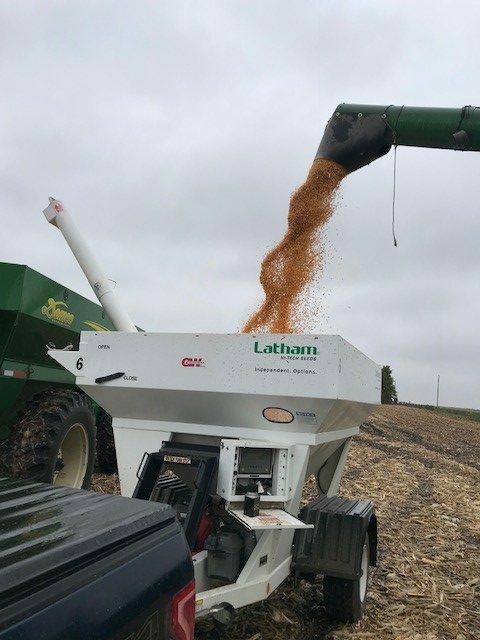 Latham’s LH 6317 VT2 PRO DG RIB was the check hybrid, and it won the plot. 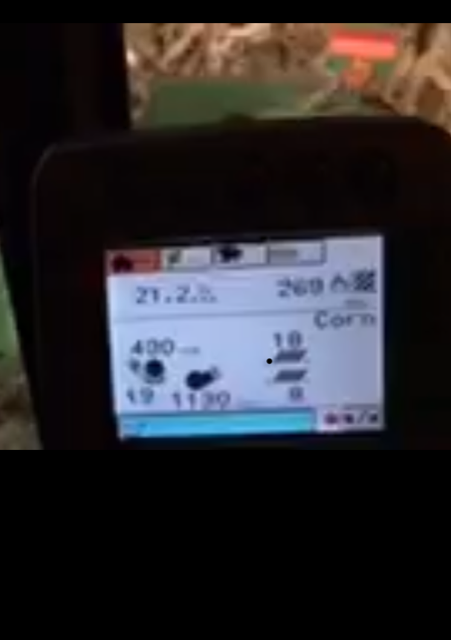 This hybrid yield 220 to 235 bushels/acre across an entire field with 16 to 17% moisture. Thanks to a couple of windy, sunny days, harvest has resumed. 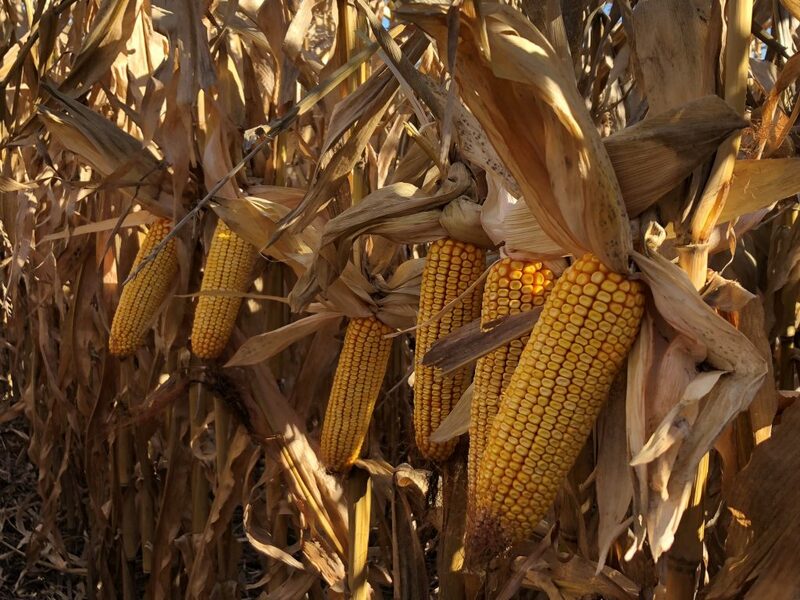 This field of LH 5245 VT2 PRO RIB was planted May 9 near Riceville, Iowa, and harvested Oct. 16. The average yield across four checks was 211.20 bushels per acre at 20% moisture with a test weight of 53.6. Rather than focus on everything that could go better, sometimes a person just needs to take stock of what is right with the world. Yesterday morning I took time to appreciate the beautiful sunrise in Humboldt County. Warmer, drier weather has returned to the forecast, and I’m looking forward to getting more crops harvested soon. STOP… that’s what the weather has done to the harvest for a couple more days! Three to four inches of snow fell Sunday afternoon across North Central Iowa. Fortunately, the snow melted quickly and warmer temperatures have returned. Sunshine and winds were welcome this week to dry out the crops and soils, so harvest resumed with a bang! 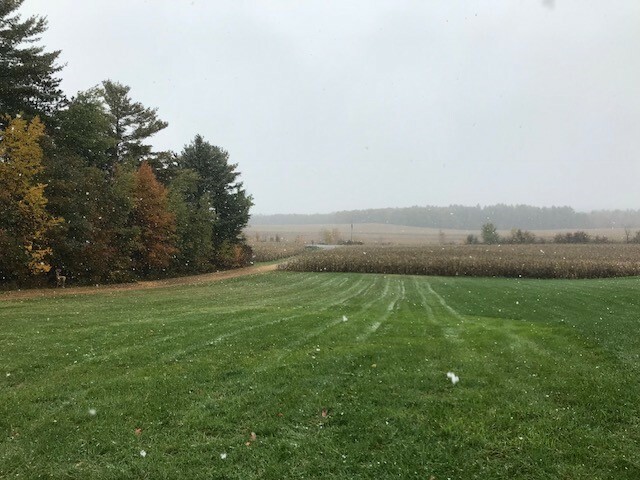 We fought through the snow last week to get our first Latham SuperStrip corn plot harvested. Precipitation brought harvest to a halt shortly after that. The weather looks promising for the next couple of weeks, so we should finally make some progress with harvest. Yields are exceptionally variable due to the excess moisture this year. 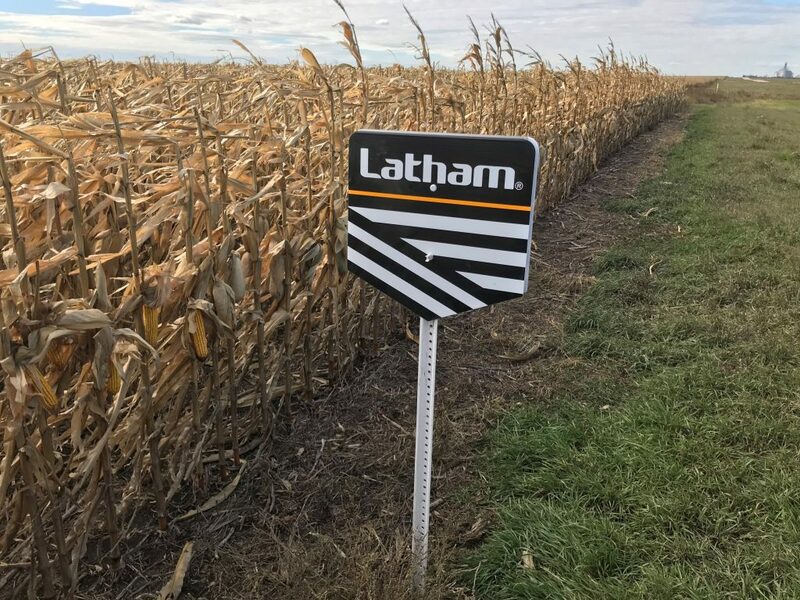 It’s nice to see this picket fence stand of Latham LH 5095 VT2 PRO RIB! I have been very impressed with the health of this hybrid, and it’s ability to yield through the stress. With farmers making seed decisions for 2019, I’ve been asked several times whether I think it pays to treat soybean seed. I believe that seed treatment may not always gain you yield, but it will protect it. Farmers, who added SoyShield PLUS™with ILeVO treatment to their soybeans this year, have seen a great response against Sudden Death Syndrome. We can’t predict the weather in 2019, but using tools like ILeVO helps protect your crops and yield. Latham Hi-Tech Seeds in 2016 sent 34 ILeVO trials to our dealers and their customers. Each trial consisted of a Latham® soybean product treated with SoyShield PLU planted side-by-side with that same soybean treated with SoyShield PLUS and lLeVO. Yield data was received from 26 of the 34 trials. Not every plot experienced a high degree of SDS severity, but many plots still showed a yield bump from using ILeVO. Plots where SDS was fairly severe showed the most yield benefit, ranging from 8 to 18 bushels per acre (bu/A). More soybeans should get harvested this week, and it looks like we have some great yield potential out there. Stay tuned! 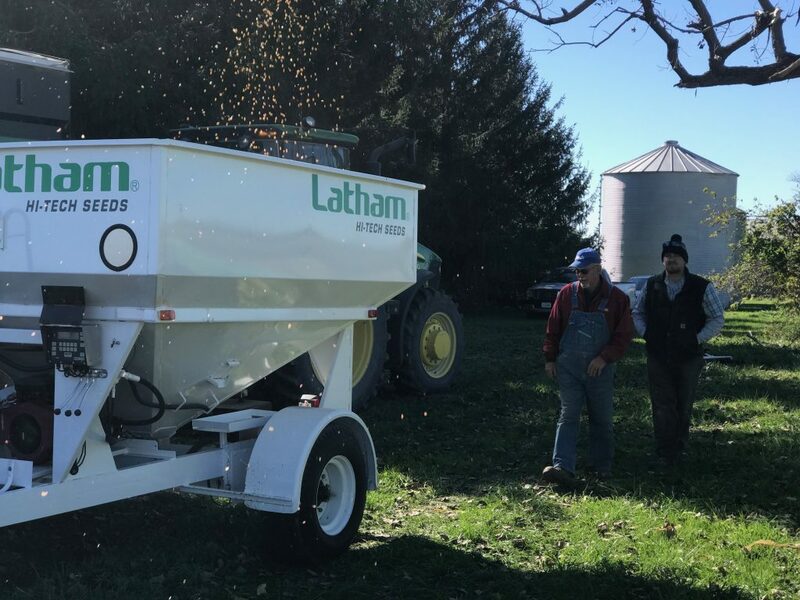 While one of our Latham® dealers undergoes his fourth round of chemo, neighbors and friends are taking out his crops. This field of Latham’s LH 5715 VT PRO RIB was running over 220 bushels per acre at 17% moisture. Now that the weather is more favorable, combines are rolling hard on this field of Latham’s L 2684 L near Emerson, Nebraska. 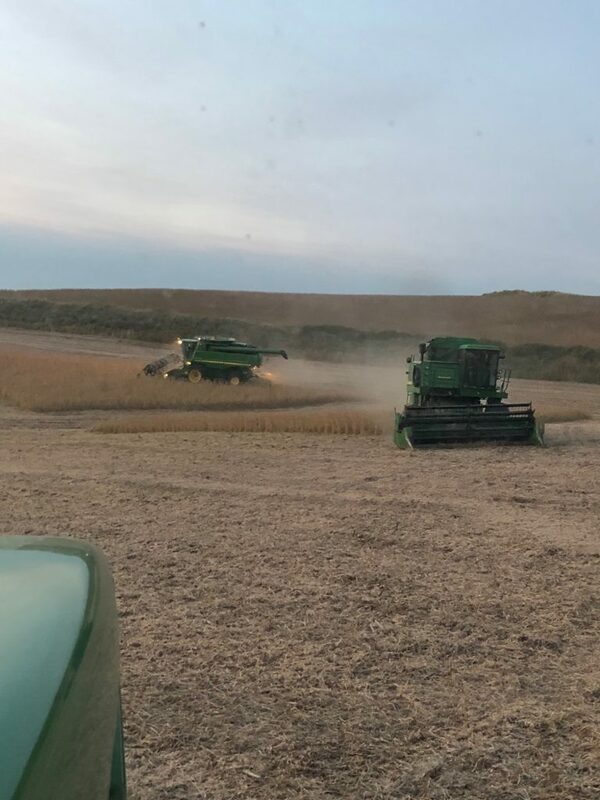 Two combines are helping make up for lost time. This Latham Dealer in Tomah, Wisconsin, wasn’t delayed by snow and rain on Sunday afternoon. 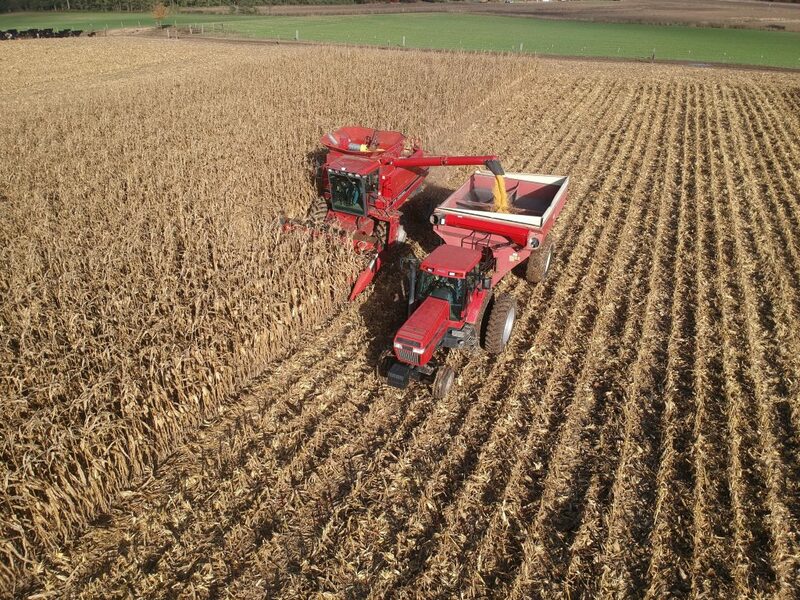 We harvested a test plot, and LH 5095 VT2 PRO RIB was impressive again this year! As a replicated entry, it was checked three times. Latham’s 5095 averaged about 15 bushel more than the rest of the field surrounding the plot. 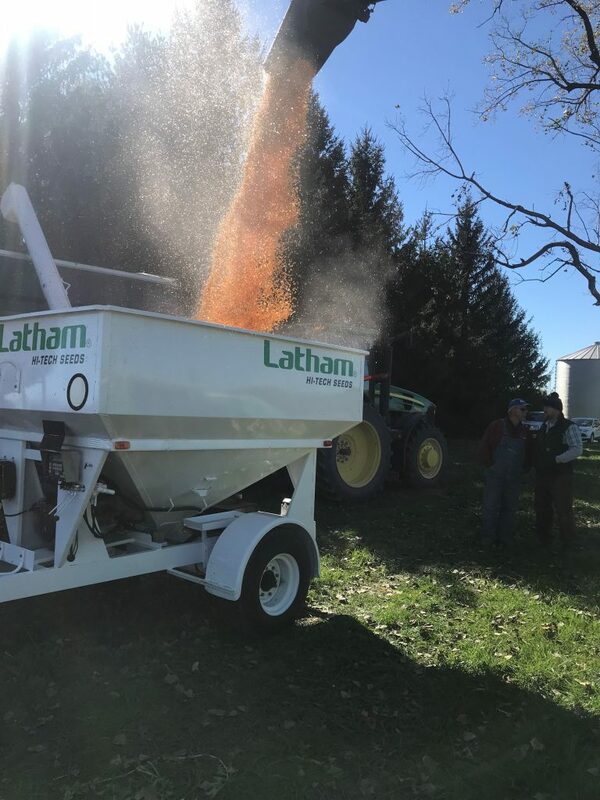 If you are looking for a consistently durable hybrid with excellent standability, ask your Latham® seed representative if this hybrid would work for you! Finally, a break in the wet weather! 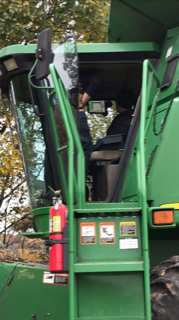 While no one like to park the combine during harvest season, the downtime allowed Latham’s knowledgeable tech team to set up Climate FieldView and provide a demo. Pictured here is one very satisfied customer as he open his first field using Climate. 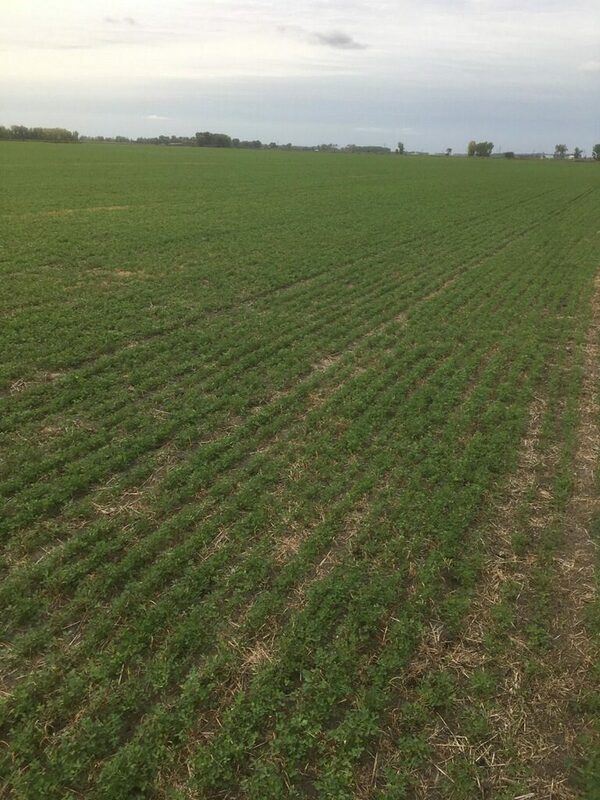 This exceptional looking field of Latham’s 480 HVXRR HarvXtra® Alfalfa with Roundup Ready® technology was planted mid-August near Hancock, Minn. 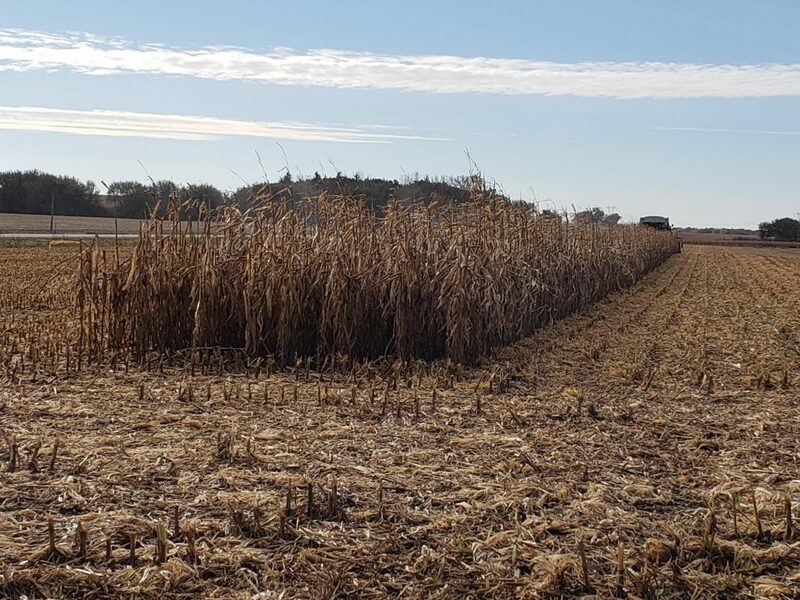 Farmers in Southeast South Dakota started getting back in the fields last Saturday after a week of very cold temperatures plus 1 to 4 inches of rain and nearly 4 inches of snow. Each day more farmers are able to get in the fields. In many areas, capacity will be a problem and farmers will be challenged to keep up with moving grain. 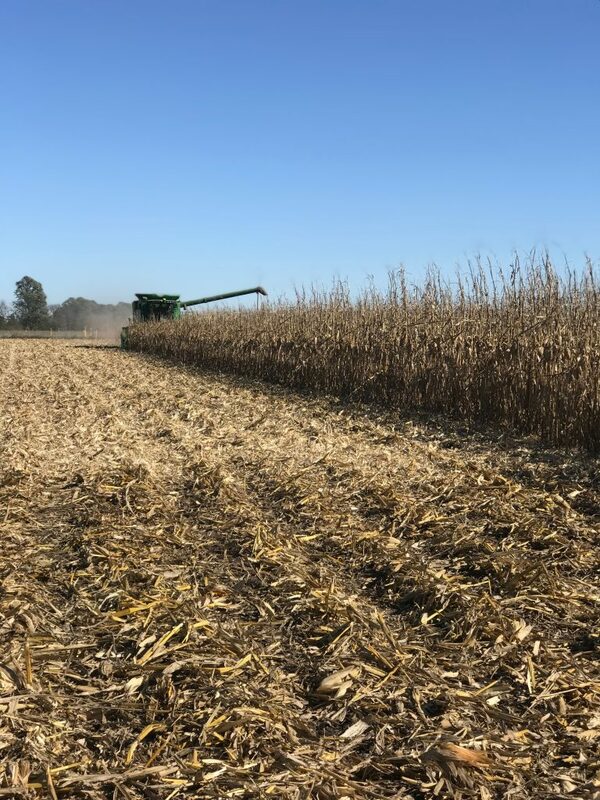 It’s a hard picture to see because the combine was in motion, but Latham 4657 VT2 PRO RIB is yielding very well in eastern Kingsbury County. This farmer said his average dry yield this season has been 255 bushels per acre (bu/A) on ground that typically runs 180 to 200 bu/A. He was only able to take the headlands off when he ran against his limits. I look forward to getting more yield reports as harvest gears back up again. Please email, text or Snap us with your high Latham yields. We love to hear them! 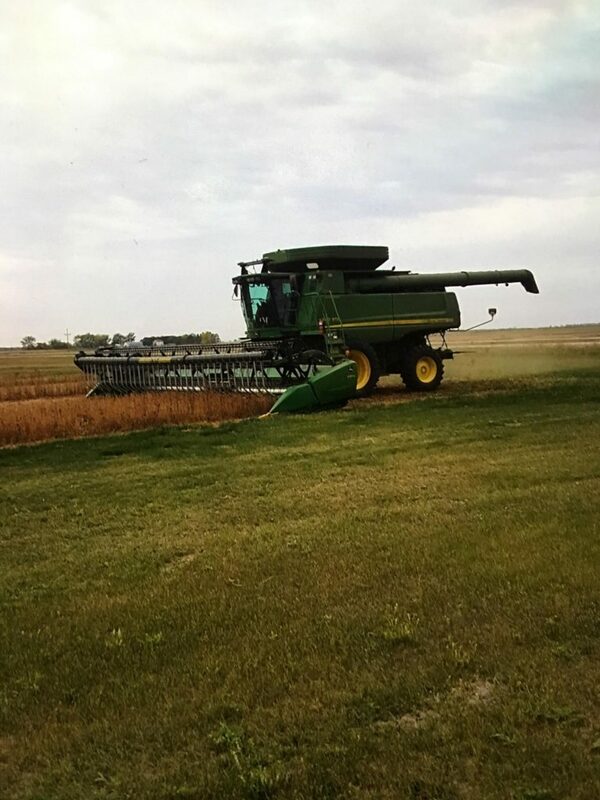 Combines are rolling again in Northeast South Dakota (NESD)! 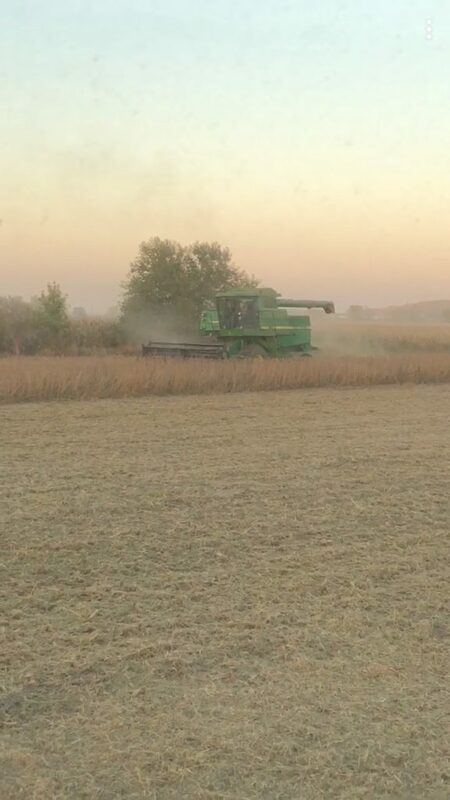 Farmers are harvesting both corn and soybeans now as soybeans have dried back down to 13%. 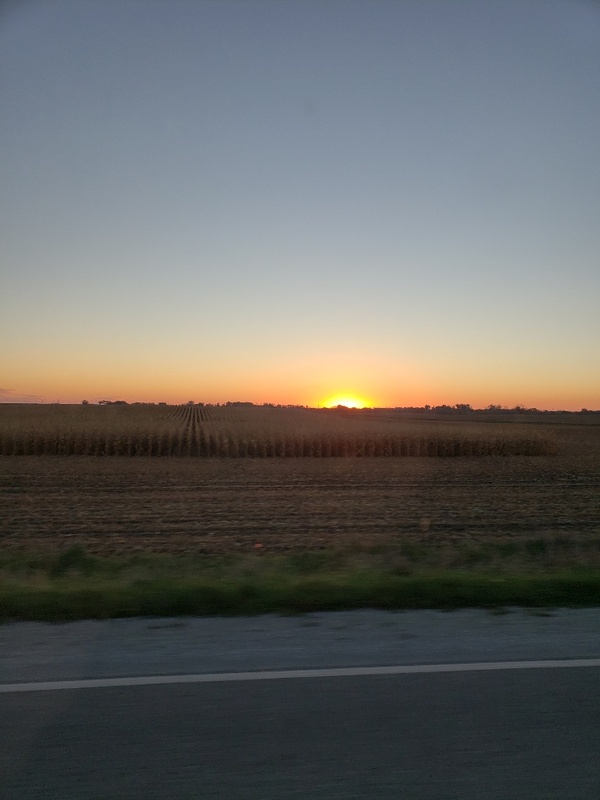 Corn yields are still strong in the east, pushing more than 200 bushels/acre! This field of LH 3937 VT2 PRO was planted at 32,000 near Watertown, SD. Moisture is back down to 18% after the rain. 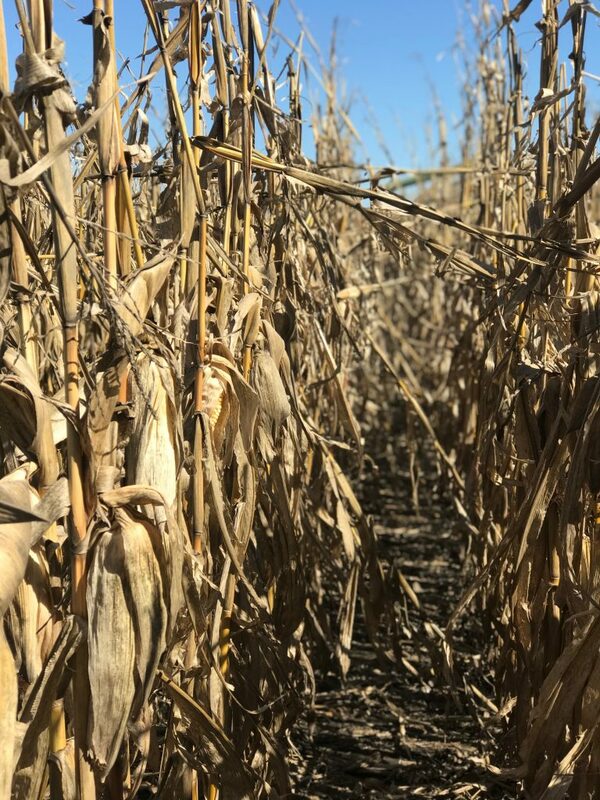 Drought was extreme in Seneca, SD, but this field of LH 4242 VT2 PRO looks like it will yield decently despite the growing conditions. Farmers are finally getting back into the fields after that very unpleasant snow event last week. 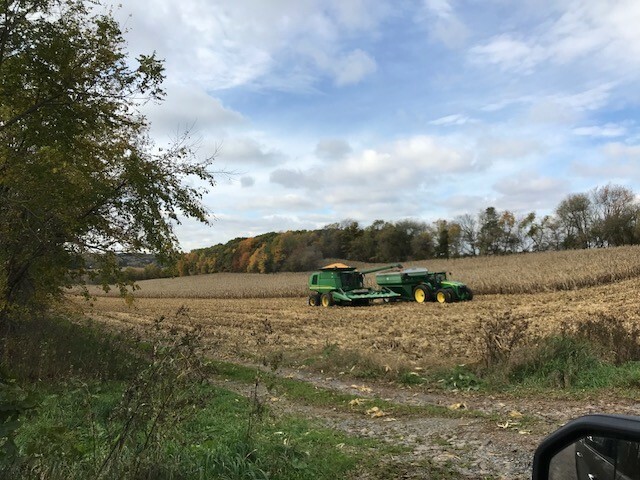 Some farmers are combining corn for the time this season, and I’m hearing seeing some very solid numbers. Soybeans harvest is complete in large areas in the state, so plots like the one pictured below are finally coming off. Stay tuned for more plot data! 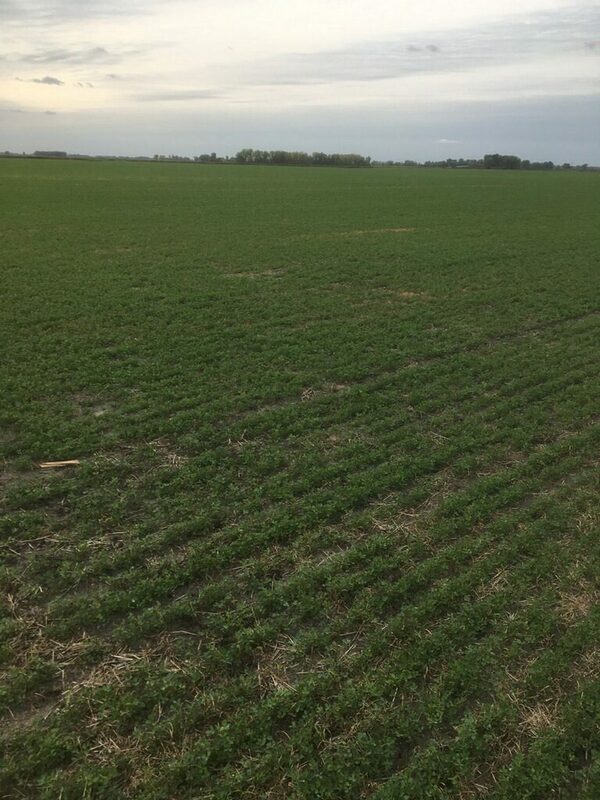 This plot is the highly visible Ideal Seed Solutions plot west of Rugby, ND, on U.S. Highway 2. Latham’s L 0124 R2X earned back-to-back first place finishes in this multi-brand plot. Even under extremely droughty conditions in the west, farmers are witnessing yield separations in these new genetics. Another new soybeans to keep your eye on is L 00828 R2X. This double zero maturity bean packs some punch! It also is Latham Seeds’ earliest IRONCLADTM soybean.